The Construction & Engineering Services industry consists of companies engaged in the construction of commercial buildings, civil engineering projects, and utility and other industrial plant construction. The industry includes highway, tunnel, bridge, dam, water works and other civil engineering operations, as well as other large-scale construction projects. Rising construction spending in the United States, state-of-the-art construction and engineering services, an impressive labor market scenario, moderate inflation and President Trump’s plans to boost infrastructure spending seem to be vital growth catalysts to the industry. However, higher raw material costs, concerns over trade tensions, rising freight expenses, volatility in commodity prices and the cyclical nature of the industry’s commodity-based business lines pose significant challenges in the forthcoming quarters. Again, significant cost overruns, as prices of several of the companies’ contracts are fixed, have been hurting some of the companies’ bottom lines. For instance, Fluor Corporation (FLR) has been facing a host of issues in some of its major projects, in the Mining, Industrial, Infrastructure & Power business, which has proven to be a drag on its top line. Moreover, increasing competition is an added woe. The industry faces intense competition in the global engineering, procurement and construction industry, which is detrimental to the companies’ contract prices and profit margins. That said, increasing defense spending in major economies like the United States, elevated public investments in worldwide transportation and water infrastructure, utility plants, as well as business prospects in the healthcare market are anticipated to drive growth for the industry in the future. Then again, the crude pricing strength has enabled the exploration and production companies to successfully resurface from the downturn by improving drilling techniques and extracting favorable terms from service producers. Additional chemical derivative and refining opportunities, both domestic and international, along with upstream and LNG opportunities should drive growth. Looking at shareholder returns over the past year, it appears that rising construction spending along with economic recovery wasn’t enough for boosting investors’ confidence in the industry’s growth prospects. Rising raw material costs, concerns over trade tensions and higher freight expenses remain a challenge. 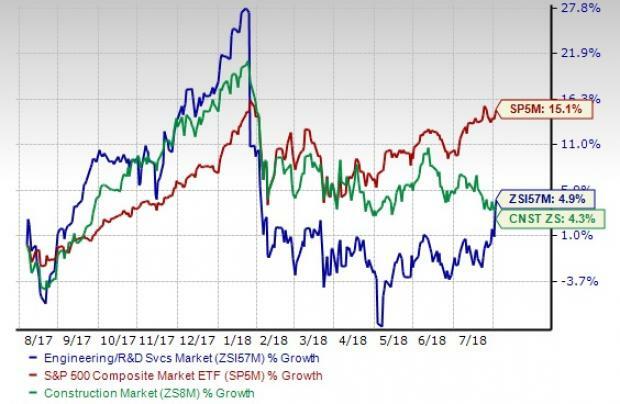 The Zacks Construction & Engineering/R&D Services industry, a 15-stock group within the broader Zacks Construction Sector, has underperformed the S&P 500 index but outperformed its own sector over the past year. While stocks in this industry have gained 4.9%, the Zacks S&P 500 Composite have rallied 15.1% and the Zacks Construction Sector has grown 4.3%. Thanks to the underperformance of the industry over the past year, the industry’s valuation picture looks attractive. One might get a good sense of the industry’s relative valuation by looking at its price-to-earnings ratio (P/E), which is the most appropriate multiple for valuing Construction & Engineering/R&D Services stocks. The industry currently has a trailing 12-month P/E ratio of 16.1X, which is on par with the one-year median level but below the one-year high of 17.7X. The space also looks attractive when compared with the market at large, as the trailing 12-month P/E ratio for the S&P 500 is 19.6X at present. The chart below compares the industry’s valuation picture with its sector. Such a comparison ensures that the group is trading at a decent discount. The Zacks Construction Sector’s trailing 12-month P/E ratio of 18.1X and the median level of 19.2X for the same period are significantly above the Zacks Construction & Engineering/R&D Services Industry’s respective ratios. With economic recovery gaining momentum and construction spending picking up pace —indicative of a major influential factor to drive the Zacks Construction & Engineering/R&D Services industry — one might expect the industry to pick up pace. However, the industry is not expected to revive too soon amid rising costs and competitive pressures. However, what really matters to investors is whether this group has the potential to perform better than the broader market in the quarters ahead. While the above ratio analysis shows that there is a solid value-oriented path ahead, one should not really consider the current price levels as good entry points unless there are convincing reasons to predict a rebound in the near term. One reliable measure that can help investors understand the industry’s prospects for a solid price performance is the earnings outlook for its member companies. Empirical research shows that a company’s earnings outlook significantly influences its stock performance. The Price & Consensus chart for the industry shows the market’s evolving bottom-up earnings expectations for the industry as well as the industry’s aggregate stock market performance. The red line in the chart represents the Zacks measure of consensus earnings expectations for 2019, while the light blue line represents the same for 2018. Please note that the $2.09 earnings estimate for the industry for 2018 is not the actual bottom-up dollar EPS estimate for every company within the Zacks Construction & Engineering/R&D Services industry but rather an illustrative aggregate number created by our proprietary analytics model. The key factor to keep in mind is not the industry’s earnings per share for 2018 but how this estimate has evolved recently. As you can see here, the EPS estimate for 2018 has dropped from $2.20 at the end of May and from $2.42 this time last year. In other words, the sell-side analysts covering the companies in the Zacks Construction & Engineering/R&D Services industry have been lowering their estimates. The group’s Zacks Industry Rank is basically the average of the Zacks Rank of all-member stocks. The Zacks Construction & Engineering/R&D industry currently carries a Zacks Industry Rank #180, placing it at the bottom 30% of more than 250 Zacks industries. Our research shows that the top 50% of the Zacks-ranked industries outperforms the bottom 50% by a factor of more than 2 to 1. The long-term (3-5 years) EPS growth estimate for the Zacks Construction & Engineering/R&D Services industry appears promising. The group’s mean estimate of long-term EPS growth rate of 11.5% is better than 9.8% for the Zacks S&P 500 composite. In fact, the basis of this long-term EPS growth could be the strong momentum in top-line growth that the Zacks Construction & Engineering/R&D industry has been showing since the end of 2016. A major boost in infrastructural and construction spending should continue to favor the industry’s performance. State-of-the-art construction and engineering services along with prudent cost management practices leveraging technology should provide support. The industry might not be able to tide over the broader challenges in the near term. So, it may not be a good idea to bet on this space right now. However, keeping the long-term expectations in mind, investors could take advantage of the cheap valuation and bet on a few construction & engineering services stocks that have a strong earnings outlook. Currently, only three stocks in the Zacks Construction & Engineering/R&D Services industry carries a Zacks Rank #1 (Strong Buy) or 2 (Buy). You can see the complete list of today’s Zacks #1 Rank stocks here. Gates Industrial Corporation plc (GTES): Denver-based power transmission and fluid power systems manufacturer sports a Zacks Rank #1. The consensus EPS estimate for the company has increased 8.6% to $1.14 for the current year, over the last 30 days. Jacobs Engineering Group Inc. (JEC): This California-based company has a Zacks Rank #2. The consensus EPS estimate for this one of the leading providers of professional, technical and construction services to industrial, commercial and governmental clients has remained steady at $4.26 for the current year, over the last 30 days. KBR, Inc. (KBR): The Houston-TX based company carries a Zacks Rank #2. The consensus EPS estimate for this global engineering, construction and services firm has increased 2.9% to $1.44 for the current year, over the last 30 days.